We are used to seeing space settlements in sci-fi illustrations and movies, but these are not realistic. Bryan Versteeg—from Spacehabs—uses scientific principles to develop concepts that can actually happen one day. The Kalpana One Space Settlement is one of them. Bryan has sent us new renders of this awesome place. 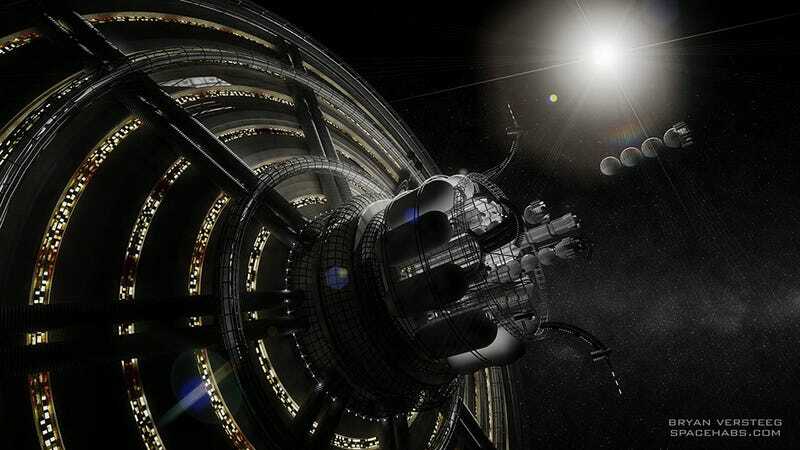 The Kalpana One Space Settlement design is the result of research into the structures and shapes that large space settlements could eventually take. In the late 60s through the 80s some shapes were defined that became the de facto go to shapes for science fiction and future imaginings. Some of these shapes however had some structural problems and would have had stability issues when rotating while some shapes were not very efficient use of structural and shielding mass for the resulting habitable volume. To find a shape that would create the most "one G" living space and habitable volume per shielding and structural mass, it was found that an elongated can shape would be very effective. Because of the dimensions of the design, it would take very little correction to prevent it from wobbling. With a radius of 820 feet (250 meters) and a depth of 1066 feet (325 meters), it would spin at a rate of two revolutions per minute to give the feeling of one earth gravity on the level where everyone would live. This means that people could live long and healthy lives while their bones and muscles would develop as they would on earth. Since this habitat will be the permanent home of its residents, it is important that it has the luxuries and recreation that would keep people happy. Although the physics of kicking or throwing a ball would be very different in this environment, the resulting variation on certain pastimes would undoubtedly be entertaining. You can see many variations of sports and activities in these concepts. Bryan Versteeg is a Conceptual Design Artist who focuses on future technologies and space exploration. He has worked with many private space companies and publishers to illustrate the concepts that will be used to take humanity into space. Kalpana is just one of them. You can follow this work in the Spacehabs site, Twitter and Facebook.